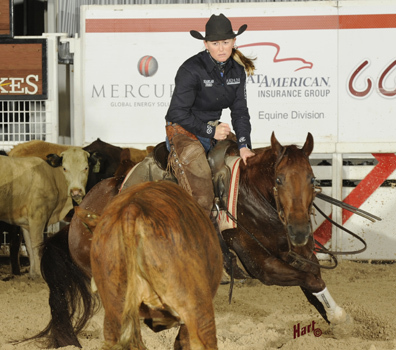 Morgan Cromer marked 217 on Maid Of Metal Sunday in the second round of the 2016 Lucas Oil NCHA Super Stakes Classic in Fort Worth to top the cumulative scores at 439. Bred by Beau and Ashley Galyean, and owned by Judy Siebel of Ross, California, Maid Of Metal is a 5-year-old mare by Metallic Cat out of Pretty Smart Kitty. Pretty Smart Kitty is a direct descendant of Doc’s Kitty, the 1970 NCHA Derby champion with Shorty Freeman. Maid Of Metal was reserve champion at the Idaho Derby and the Pacific Coast Winter Roundup with Cromer, and has earned more than $44,000. Cat Sheree, by High Brow CD, ridden by Sean Flynn for Plantation Farms, posted back-to-back 219s for the second high cumulative score of 438. Dont Stopp Believin, last year’s Super Stakes co-champion, posted Sunday’s high score of 220 and will advance to the finals with a cumulative score of 434.5. The Dual Rey x Dont Look Twice 5-year-old is owned by Phil and Mary Ann Rapp, and ridden by Phil. Twenty-nine horses marked 434 or higher to advance to the finals, scheduled for Saturday, April 2.